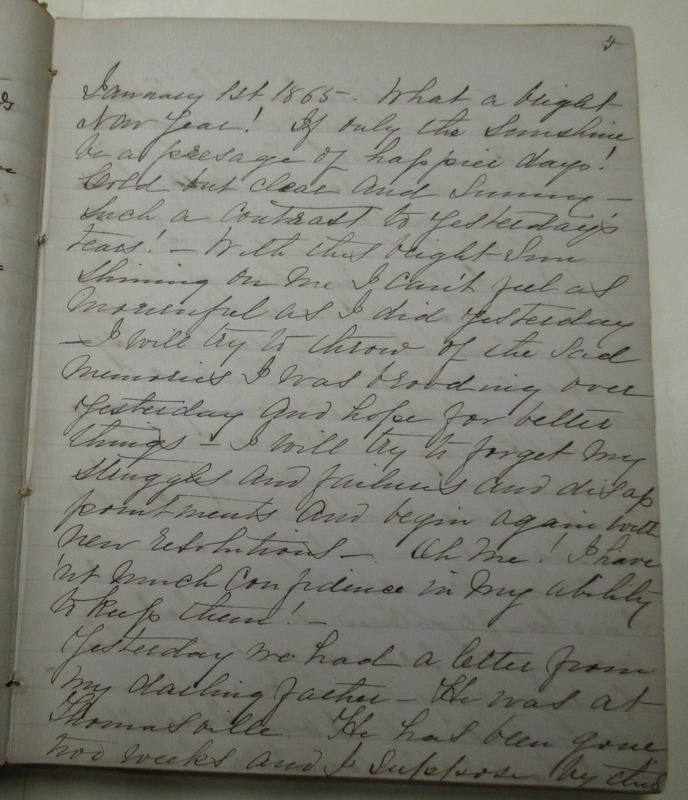 Item Description: A diary entry on the New Year in 1865 where Emma LeConte, from Columbia, South Carolina, hopes for a better year and reflects on news of the Yankees passing through plantations. Item Citation: From Folder 1, in the Emma LeConte Diary, #420-z, Southern Historical Collection, The Wilson Library, University of North Carolina at Chapel Hill. What a bright year! If only the sunshine be a presage of happier days; Cold but clear and sunny – such a contrast to yesterday’s tears. With this bright sun shining on me I can’t feel as mournful as I did yesterday. I will try to throw off the sad memories I was brooding over and hope for better things. I will try to forget my struggles and failures and disappointments and begin again with new resolutions. Oh, me! I haven’t much confidence in my ability to keep them. Yesterday we had a letter from darling father. He was at Thomasville. He has been gone two weeks, and I suppose by this time he is at the Altamaha. The Gulf Road only runs thus far, and there he will have to stop and get word if possible to Aunt Jane, with Sallie, Cousin Ada and Cousin Annie to meet him. If that is impossible he will try to make his way through the lines to them. Though I never say anything about it, I feel uneasy in regard to father. The Yankees have been through Liberty County, burning and destroying, and I hear they have passed right through out plantations. Father says however that he has heard of no outrages committed. But how dreadfully they must have been frightened. And what is worse, if the provisions have been destroyed they may be suffering. The uncertainty is very horrible. But how accustomed we have grown to what is horrible! We had a letter from Grandma too. She had left us to be with Aunt Sallie in her confinement. She gives a long account of her journey, performed mostly in Government waggons with Lee’s men. Poor Aunt Sallie suffered dreadfully, and her babe was born dead – the result of the fright she experienced when the enemy passed through Milledgeville. The old year did not die without bringing us one more piece of bad news. We heard yesterday that Gen. Price – old “Dad Price” – was dead. Misfortunes assail us on every side. The President however is quite well again. What a sinking of despair I had when I heard that he was dead. 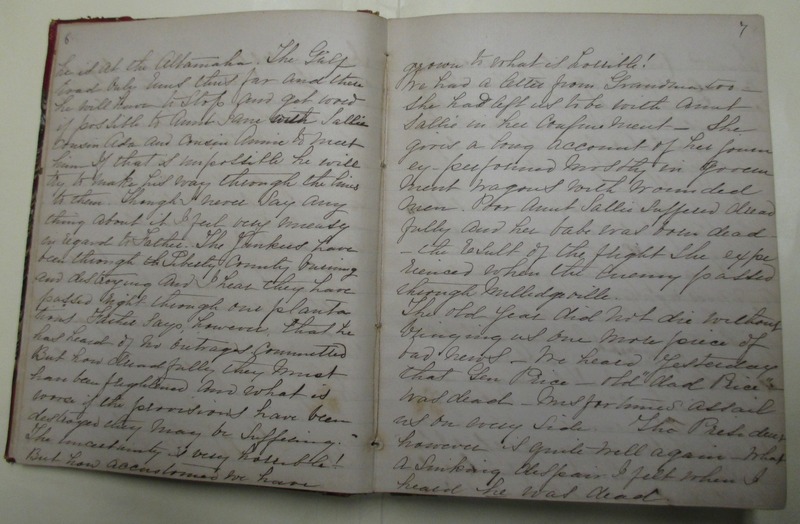 This entry was posted in Southern Historical Collection and tagged Emma LeConte Diary, South Carolina, yankees. Bookmark the permalink.